After debuting as a screenwriter with Torment (Hets, 1944), Ingmar Bergman was already directing his ninth film, Thirst (Törst, 1949), five years later at the age of 31. By that time his cinematic repertoire had evolved into his signature blend of stageplay theatrics combined with vivid and dynamic cinematography. In fact Thirst seems almost like a mannered artist’s study piece, illustrating how the filmmaker explored some of the extremes of his artistic palette. Thirst was originally released in the UK as Three Strange Loves, which I think is a better and more apt title for the film. Its story revolves around the ruinous romantic relationships associated with three psychologically troubled women, and it is based on a collection of stories written by Birgit Tengroth. This was one of the few Bergman films that he did not co-script. In place of doing that, he arranged for a different level of story involvement by recruiting Tengroth, who besides being a writer was a veteran actress, to play one of the lead roles in the film, and he consulted her on how some of the scenes should be interpreted. The film begins by showing a married couple, Bertil (played by Birger Malmsten) and Rut (Eva Henning), arising in their hotel room in Basel, Switzerland at the conclusion of their vacation. 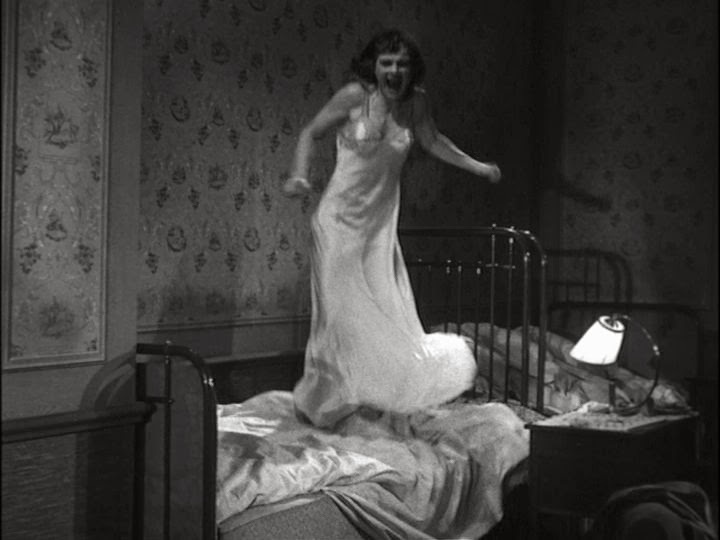 One of the very first shots is one that lasts 200 seconds and shows Rut wandering around the hotel room engaged in routine activities that reveal her generally compulsive nervousness. This kind of very long-lasting shot that follows the movement of characters as they move around a room becomes a visual motif and appears frequently. Because of the considerable character and camera movement, the shots are not at all static, and they reveal what must have been a very carefully worked out cinematic choreography. After awhile, Rut sits down in the bed and starts reminiscing into a flashback scene concerning an earlier love affair with a married man named Raoul. This flashback sequence shows Rut, at the time a 20-year-old ballet dancer, in love with military officer Raoul (Bengt Eklund), who is a domineering male chauvinist. There is a particularly interesting 4-minute shot showing Raoul’s wife paying a hostile visit to Rut at her apartment, in the middle of which Raoul shows up. From a cinematographic standpoint, this may be the high point of the film. The unwinding of this relationship is soon revealed. Rut becomes pregnant, and Raoul denies his fatherhood and any responsibility. Rut then has a late-term abortion, which results in complications leading to her sterility and the ruination of her ballet dancing career. The action returns to Rut and Bertil, who begin what will be a constant bickering for the rest of the film. Each complains the other is still carrying the torch for a past romance – in Rut’s case it is for Raoul, while Bertil is accused of still having some involvement with an emotionally troubled woman named Viola (Birgit Tengroth). Rut and Bertil then board a train headed back to Sweden. The action now switches to Viola in a different location, presumably back in Sweden. The death of Viola’s husband, prior to her involvement with Bertil, left her with serious psychological problems. She is being treated by a psychiatrist, Dr. Rosengren (Hasse Ekman), who, it turns out, is, himself, a sadistic narcissist. Rosengren wants to seduce Viola, and he uses his clinical authority to torture the poor woman into subservience to his evil desires. There is another interesting cinematic sequence here – a 90-second shot of Rosengren and Viola in very extreme closeup, facing each other. The action returns to the quarreling Bertil and Rut again, now on the train, and there are other long shots – one almost 4 minutes in duration and another of 3 minutes – of them interacting within the tight confines of the railway car. Actually, the quarreling is rather one-sided. Rut is always the instigator, and though her rapidly changing moods lead to quick reconciliations, she increasingly reveals herself to be neurotic. Rut now reminisces about her experiences prior to her involvement with Raoul, when she was in ballet school and was emotionally bullied by her eccentric school mistress, in response to which she was comforted by her friend Valborg (Mimi Nelson). Valborg is solicitous, maybe a bit too overly so, and we later learn that she is a lesbian. The action shifts to the present, where Valborg runs into Viola on the street. It turns out that they were classmates in secondary school, which closes the circle of linkages between Rut, Viola, and Valborg. Valborg invites Viola to her apartment, where they have an extended conversation leading up to an attempted seduction of Viola by Valborg. 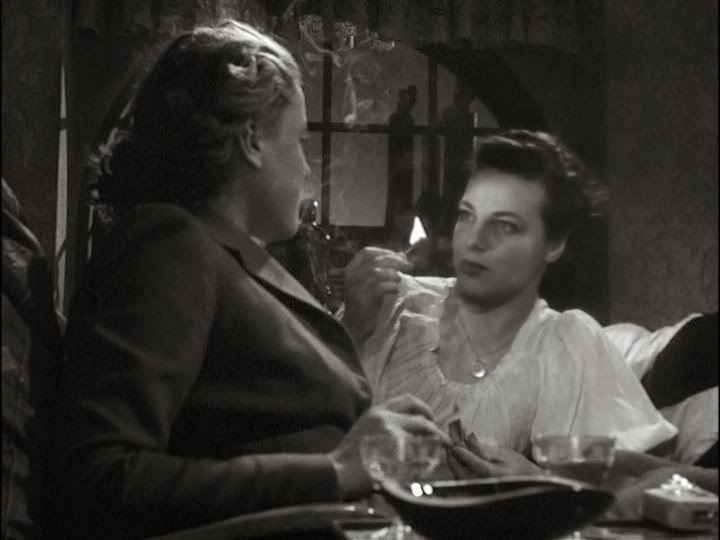 The topic of lesbianism was basically out-of-bounds for explicit presentation in the media at this time, and Bergman complained that censors cut much of the footage from this scene. 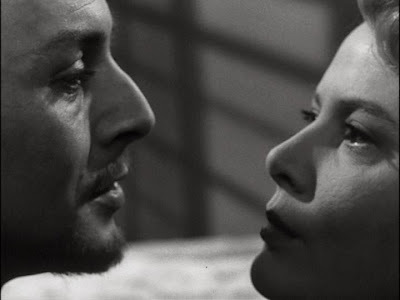 Valborg’s attempted romantic embraces horrify the already troubled Viola, and she rushes out of the apartment and eventually drowns herself off a nearby harbor pier. Back on the train, Bertil has been suppressing his growing aggravation over Rut’s incessant nagging and explosive temper tantrums. There is a scene showing him finally killing Rut, but it turns out to be a dream. When he wakes up, he is glad to discover Rut still alive, and they embrace in the closing shot. Although the film ends on a moment of uplift, this is basically a dark story of suffering people. A major theme seems to be the power of memory – particularly unhappy ones – and how they exert a hold over our lives. Rut is obsessed with how her affair with Raoul both made her maternally sterile and ended her ballet career. Valborg says that her past experiences have led her to reject men entirely and to seek comfort in another direction. Viola’s grief over her husband’s death (prior to the events depicted in this film) is so unendurable that she can no longer live. But these experiences are merely sequenced and don’t seem to suggest a comprehensive picture. In fact as a basic narrative, Thirst has some serious flaws. Although Rut and Bertil are presented as physically moving on the train, there is no actual narrative movement to the film. All we have is a collection of dysfunctional personalities that make no progress towards resolving their problems. Rut comes to be seen as an insufferable harridan who is evidently suffering from bipolar disorder. Viola is opaque, since we never get to see how she came to her miserable state. The same is true for Valborg, who is only seen briefly. The men are even more unfathomable. Raoul is a singularly unsympathetic egotist. Rosengren is so evilly manipulative that we wonder if he himself may be suffering from some psychopathy. And Bertil’s submissive passivity also seems quizzical. It is presumably easier for an actor or actress to play such a theatrical role, since the speech and gestures can be outlandish and therefore outside the scope of customary behaviour, but this leaves out any subtlety of expression. In the end we viewers don’t understand or empathize with any of these characters, which reduces any involvement we might have in the narrative. This leaves the final supposed reconciliation of Bertil and Rut as completely unmotivated. It is all just an artificial way to end all the suffering we have seen so the theater lights can be turned on. So I would say that the virtues of this film lie in its cinematography (including some theatrical mirror reflection shots ), not in its narrative. 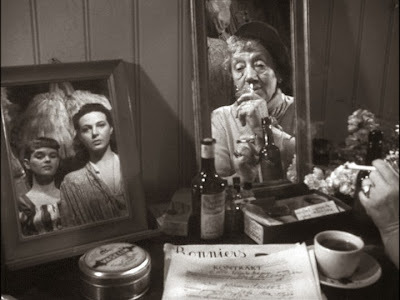 For further discussion of mirror shots, see the review of Torment (1944).